Carry The Vision - Week 2: "You Are The Vision"
This week I am concluding a two-part sermon series on the vision of our church with a sermon entitled, "You Are The Vision." We spent a lot of time last week talking about what happens to a church when it loses it's vision, purpose or direction. The bottom line? It begins to die. If nothing is done to regain the vision or find a new one, it's almost inevitable that such a church will die. Since these two sermons are virtually one sermon in two parts, I am going to pick up where I left off last week... with Jesus. The vision that my church has embraced is grounded in Scripture and in experience. We decided several years ago that we were being called by God to be the kind of church that didn't exist just to exist. We asked ourselves a question: "If we ceased to exist tomorrow, who would miss us?" That question led us to believe that our church was supposed to "Reflect and Reveal the Unselfish Love of Christ." In Philippians chapter 2, the Apostle Paul encouraged the first century church to have the "same mind as Jesus Christ" who "humbled himself" and took on the "form of a servant." Jesus love was unselfish and sacrificial. People need to see this kind of love from Jesus' followers. My church has the crazy notion that when you know Jesus, you want to show Jesus to the world. This week I am preaching on something that Jesus told his followers in the Sermon on the Mount: "You Are The Vision." Don't remember that particular phrase? Well, it's probably because I interpreted what he actually said---"You are the light of the world"---a little differently. But at it's very essence, that famous commissioning phrase could easily mean "You Are The Vision." There can be no vision without illumination, right? Works for me. Let me shift gears here a moment, since we're starting to talk about light, and say a few words about darkness. Think of the darkest place you have ever been. There was this old gold mine in Cripple Creek, Colorado that I remember when I was a kid. When you travelled down the mine shift on an elevator you would go hundreds of feet below the surface of the earth. And then they would turn out the lights just so you could experience the darkness. It didn't matter how long you were down there in that darkness, your eyes never really adjusted to it. It was oppressive and smothering. Think about the darkest place you have ever been spiritually or emotionally. Sometimes we have dark spaces in our life where it feels like the light of hope will ever reach. Maybe you've been there. Maybe you are there. In John chapter 1 we have this fantastic introduction to the Gospel that basically mirrors the Creation story in Genesis. It goes on to say, "In [Jesus] was life, and that life was the light of all people. The light shines in the darkness, and the darkness has not overcome it." The light of the New Creation isn't stifled by smothering darkness. It just isn't. But God didn't leave it there. God's plan for bringing light to the world began with Jesus, but it continues through his followers. You see God has an annoying habit of using broken, imperfect people like you and me to accomplish his will. He likes it when people take the light into the darkness. He wants us to be the vision. "You are the light of the world. A city on a hill cannot be hidden. Neither do people light a lamp and put it under a bowl. Instead they put it on its stand, and it gives light to everyone in the house. In the same way, let your light shine before others, that they may see your good deeds and glorify your Father in heaven." My imagination has always been captured by the phrase, "city on a hill." What was Jesus talking about? When Jesus was preaching the Sermon on the Mount he was high above the Sea of Galilee in an area that had a wonderful panoramic view of the surrounding area. High above Jesus and the crowd was a town on top of a mountain. That town, Zefat, was an ancient city that was already considered a holy place in Jesus day. It still exists today, and is still high above the area where Jesus was teaching. I looked at this village in the evening when the lights in the houses there were twinkling brightly. The city was the only thing on the hill, which was dark. It glittered like a jewel on that hill. I bet it did the same thing in Jesus day. You see, Jesus wanted his disciples to clearly understand that being the vision that God had in mind came down to three things. Being Obvious, Illuminating and Welcoming. When a church, a community of faith possesses these three qualities, people feel it when they walk in the door. They don't know exactly why, but they know that something is happening in such a church. Oh, and we are also called to be light, to be the vision, because our destines more than our past defines us. By focusing on sharing our light in the darkness we can't help but move forward. History is important, but we were never intended to live in History. 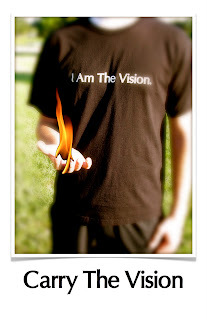 So this Sunday everyone at my church is being asked to wear their "I Am The Vision" t-shirts to church. I am sure that there will be some grumpy folks who don't care for our endorsement of a "casual Friday" on Sunday morning. But we need to do this. I feel it in my bones. First we need to be reminded who we are. The sight of a bunch of people wearing black and white t-shirts that read "I Am The Vision" in church will be one that most of us won't forget. Jesus commissioned us to be the vision. Don't forget it. Second, we need to be unified. We need to know that we are not alone in this. There's nothing like a crowd of folks all dressed alike to make us feel like we are part of something bigger than we are. Third, it's inviting. When we wear our shirts, people wonder what in the world it means. Maybe they'll ask us. Maybe we'll get a chance to share. Maybe they'll think that a church that believes that kind of thing might not be a bad place to visit. Listen. You Are The Vision. Hear that. I know that's true because it's grounded in Scripture, but I also see it happening right in front of me. Our church feeds the hungry each and every week. We started Center Street Kitchen over two years ago and fed 6 people on the first day. Now we feed an average of 170 a week, and through generous donations we are adding bag lunches to the mix, and a second day of feeding folks. A few days ago we prepared nearly 300 meals for hungry people. You Are The Vision. Our church clothes closet provides clothes to the needy every week. We have helped people find clothes to wear to job interviews, helped needy moms clothe their children and much more. You Are The Vision. Every week we welcome children into our church both from our church and from our neighborhood. Through our Children's Ministries, children are learning what it means to be a follower of Christ and a member of a church family. At Crossfire Ministries, children who are at risk---many of whom have parents in jail, and who seldom get a decent meal during the week---are loved on, introduced to Jesus and allowed to be kids for just a couple of hours a week. Our teenagers at Revolution Youth are learning what it means to be more fully committed follower of Christ in word and in deed. You Are The Vision. Ministries like Lifetree Cafe are reaching out to people who are struggling with faith and doubt. Many of these folks are not Christians, many more have been wounded by the church, and church people. And they are finding space to discover Jesus. You Are The Vision. Over the past year over 170 prayer requests have been made through our prayer chain, and have been prayed for by our prayer warriors. Recently, one of our members was battling cancer and she was surrounded by friends who drove her to her chemo treatments, took care of her dogs and just loved on her when it became apparent that the treatments weren't going to work. Another member who is on our visitation team makes regular visits to shut-ins who are suffering from Alzheimer's. This member helped one of her regulars, who suffers from Alzheimer's, write a note to her daughter to tell her how proud she was of her. Even though she doesn't always recognize her daughter, this lady was so happy to write that letter, and when her daughter---a church member---received it, it was as if she received a message from God himself. You Are The Vision. You Are The Vision. You carry it with you wherever you go. On the night before my very first sermon at First Church over three years ago, I walked through every room in every building on our campus praying over my new church. As I walked these buildings, praying, God began impressing on my heart that this church, which had lost it's vision, would find it once again. I was filled with an overwhelming sense of hope. I had no idea where God was leading, but I knew that it was my calling to ensure that we followed. It's time for us to renew that sense of call, and to covenant with one another to keep following. My beloved congregation... You are that city on a hill. You cannot be hidden.